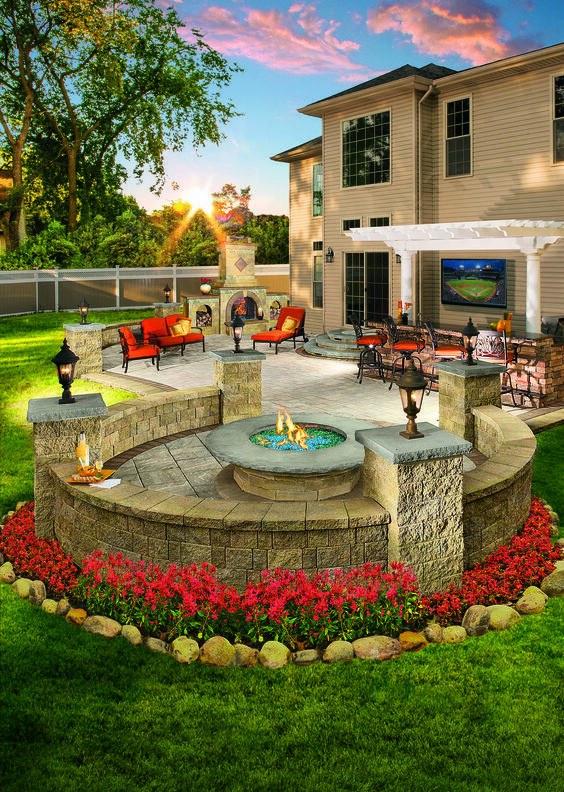 Patios are traditionally made with natural stone, concrete, or gravel. Pavers are an option composed of concrete and a color additive to form a tile, stone, or brick-like pieces. Patios are similar to decks as both provide outdoor space, usually in the rear of a home, for relaxing, dining and entertaining guests. While decks are often elevated structures made from wood or composite materials, patios, on the other hand, are routinely installed at a ground level. Size, of course, is the main cost factor. A small patio, say 7 by 7 feet provides a cozy place for two to share a drink. If desiring a place to dine, at a table with 4 chairs, then a mid-sized patio around 12×12, or larger, is the size to consider. Large patios offer an outdoor living room, coming in at 15 by 15 or larger. Nothing says a patio needs to be square in shape, and rounded edges, or rectangular patios are quite common. The price to install is based on material times square footage. On average, patios cost from $1.50 to $30.00 per sq. ft. installed. That’s a huge gap, but the median range is closer to $6.00 to $12.00 per sq. ft. installed. Generally, the least expensive material is a gravel patio, while flagstone fetches the highest prices. Before any work begins, planning is the first step. In some areas, you may need a building permit and a site plan to provide your local zoning office with the patio design you seek to implement. As the approval can sometimes take weeks, other planning considerations include what accessories you may wish to furnish your patio with, along with how each item will lay out. Since everything is at a ground level, you might consider laying items on the lawn to get a feel of layout in a three dimensional way that a site plan won’t readily convey. To help understand what a patio installation project entails, let’s provide four example projects based on the primary materials and various sizes. To keep it simple, we’ll assume everything is square or rectangular. Please note: these are ballpark estimates based on national averages. Comparing these project costs to similar sized deck installation and you’ll notice it is much less expensive. There’s no need for the elevation, stairs, railings and trim surround the installation. Still, flagstone patios or really any large patio, can be modestly expensive. If you subtracted the labor charges from each of the above examples, you could essentially cut the prices in half. A gravel patio is routinely installed as a DIY project and can easily be had for under $500 for mid-size patios or smaller. All of the materials can be done via the DIY approach, though there are a few caveats. Materials to complete the project is what a contractor brings with them to the job and takes away. Going the DIY route means you’d purchase materials to grade (or level) the land including rakes, and stakes to mark the area. Additional tools include tape measure, level, shovel, wheelbarrow, saw, gloves and goggles. If you have all that on hand already, then the costs can be kept to a minimum, or essentially the price of materials. Experience is an important factor for doing the job. Experience makes for more expedient completion and that it is done well. Working with stone means heavy lifting, which is fairly labor intensive. Professionals are usually working with a crew of at least two people, and sometimes as many as four, all with the incentive to stay on until the job is finished, and done to homeowner’s satisfaction. Material costs will vary. All the materials can be purchased at your local home improvement store such as Home Depot or Lowe’s, via retail rates. This will probably be economy based material or at best mid-grade. A professional patio installer will obtain or have access to high-grade material and ability to purchase it at wholesale. With this said, it is strongly recommended you get multiple costs for this type of project if using anything more expensive than gravel to complete the work. Once the patio is installed, it’ll be time to make it a usable space. What you put on it, can be added to over time, but you’ll want to use planning stages to address the basics. Costing all this out is too challenging to cover in an article as options are based on subjective desires. Furniture of some sort is likely and can be had for very little expense, especially if going with second-hand items. To get an idea of what’s available, take a gander at the many options listed at Houzz.com. Many of the items listed here are just a couple hundred dollars, but some are more expensive than what you may pay for the patio installation. 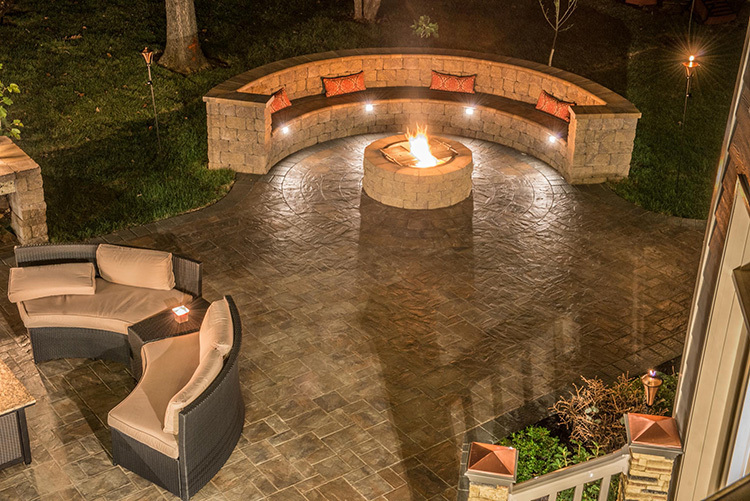 Modern patios often make use of a fire pit or chiminea. These are both essentially outdoor fireplaces that can make for a great centerpiece for social gatherings. You’ll obvious want these installed away from your house, but with a stone patio, the concern for combustion is less than if you install similar items on a wood deck. Similarly, today’s patios are sometimes transformed into outdoor kitchens. This can get quite expensive, but does offer your home a second kitchen. Though we ought to note that unless designed supremely well, the ROI on such an additional is usually low. How outdoor kitchens are laid out and ultimately utilized is a matter of personal taste, no pun intended. Our final example above included the option of an outdoor sound system, which is consideration for any outdoor space, regardless of size. The price is based on number of speakers, but during construction, electricity installation is the primary consideration. This also opens the door to lighting or other modern conveniences. While it’s possible to construct a patio with a permanent ceiling and still keep the outdoor feel with open walls, many people consider installing a pergola. Pergolas can be pre-fabricated or built on site to provide pillars and an open ceiling that could benefit from temporary covering material, so that sunlight seeps through overhead on super hot days. Then there are the little things that make a patio feel like an interior living space. Throw rugs, pillows, and who can forget the flowers and plants. Some people construct patios with the sole purpose of having a fresh garden as near as possible to their home — that adds the character and natural beauty. The history dates back to ancient Rome and has long served as a place for gathering in an open courtyard type setting. 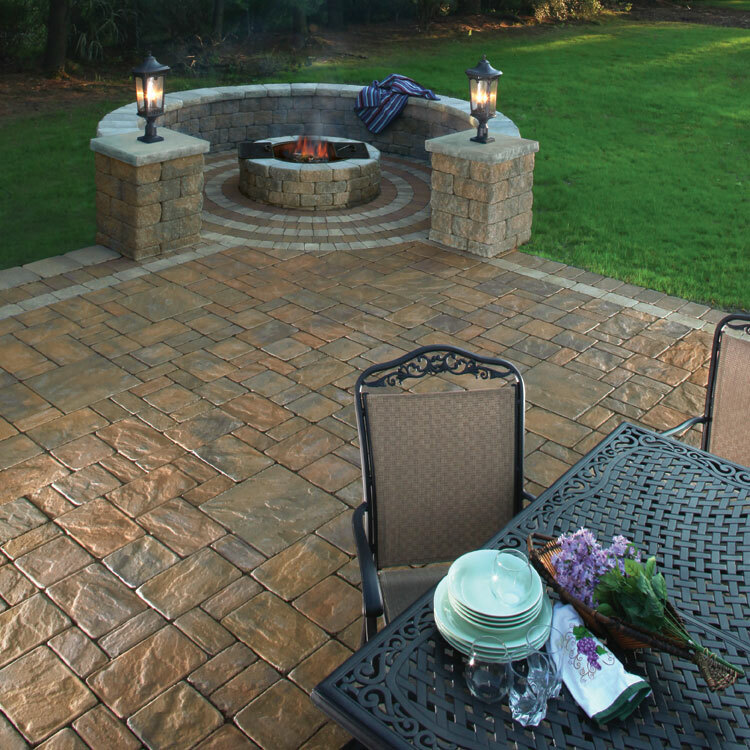 Today’s patios offer an affordable option for virtually every homeowner to enjoy outdoor amenities, such as a chiminea. Here we list the pros and cons, along with the chief reason for why to consider a backyard patio. While patios don’t have as much ROI as a deck (which is at 80%) they can still mean added property value and an average ROI at 55% or higher. Well designed patios do obtain 80% ROI. Compared to decks, patios are easily maintained with no need for yearly expenses to increase the longevity of the base material. Being non-combustible is a nice advantage as well. Stone is susceptible to cracking which an take away from the beauty of the space. Being built at ground level has some obvious disadvantages. The need for grading might be fairly expensive in yards that are sloped or hilly. Plus, a fine smooth surface can make for slippery conditions, especially in colder regions where icy patios are possible. Patios blend in well with yards and extend living space very well. They are very economical means to achieve a great balance between livable space and luxury landscaping.